Dores Factory was exploring the east this February, taking part in “Eco House & Eco Building Expo” in Tokyo, Japan. To find out more about the importance of a home and traditions in this distant land we engaged in a conversation with the first Ambassador of Latvia in Japan Pēteris Vaivars and his wife Rina. Japan has all four seasons: the winters are mild, and the summers can get quite hot. Houses are constructed with summer heat in mind – it is more important to live comfortably in summer months than winter months. An ancient Japanese well-known essayist, named Kenko, a Buddhist priest, has said: “A house should be built with the summer in mind. In winter it is possible to live anywhere, but a badly made house is unbearable when it gets hot.” Even in modern days, this saying is often referred to since it eloquently describes the unbearable hot and humid climate of Japanese summer. Such architectural approach is completely opposite from the one in Latvia, where people build homes to stay warm in cold winter months. Homes in Japan have thin walls, long eaves to prevent sunshine of summer from coming into rooms, sliding doors and walls, which make these homes chillier during cooler weather. “I was once visiting an old temple in early spring when sakura blossoms had yet not faded,” Pēteris tells. “We sat at a Kotatsu eating and drinking sake. Kotatsu is a low, wooden table frame covered by a heavy blanket, upon which a table top sits. Underneath is a heat source, often built into the table itself. 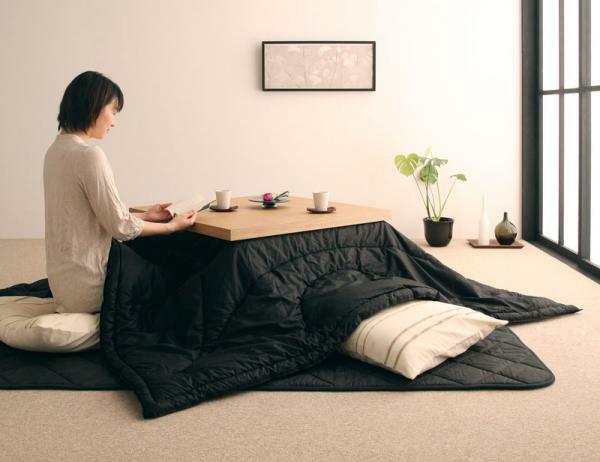 Kotatsu allows to cover legs with the blanket to make dinner more comfortable and warm. Such localized heating is very common in old Japanese homes. The differences between a European home and Japanese home are growing smaller in the big cities, but not all home furnishing traditions have disappeared. “When I was a little girl, the floors in my parent’s home were covered with tatami – a carpet made from rice fibre. People sleep and sit on tatami. The only furniture is a little table by which one has meals. In the evening the table gets put aside and we sleep on futons that we place on tatami. Sitting and sleeping on the floor is a tradition – a way of life since ages past,” Rina tells. 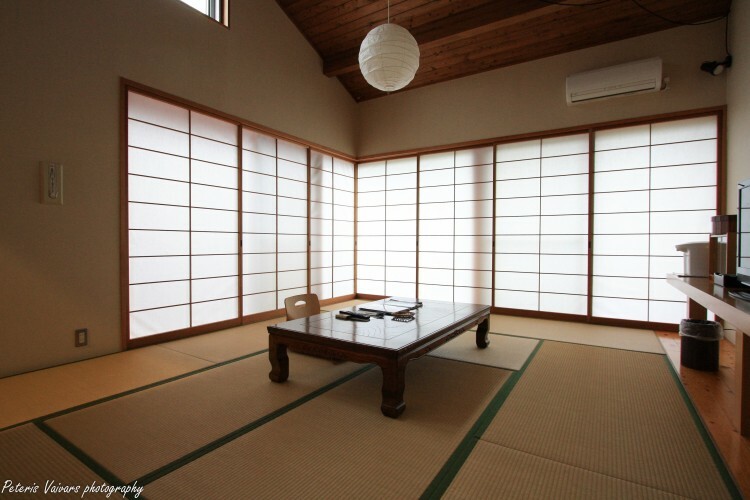 Living room with tatami in a countryside. 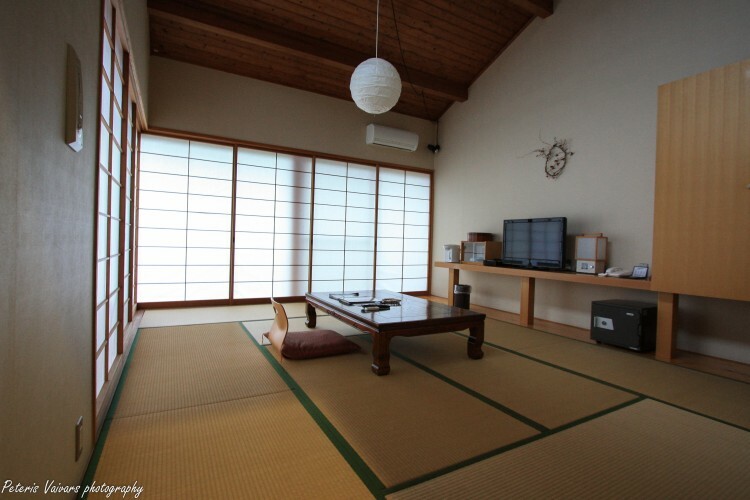 Nowadays tatami can be found mostly in rural homes; the urban Japanese sit on chairs, sleep in beds and eat by high tables. 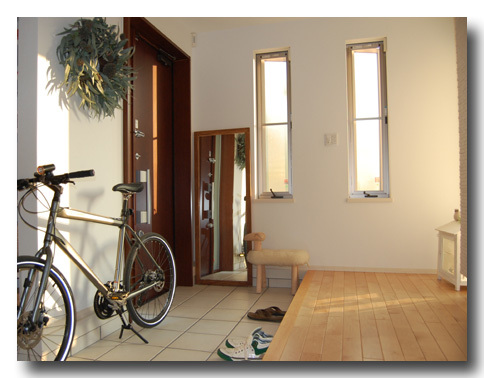 The furnishing has remained minimalistic because of the small living spaces. Usually closets and shelves are built-in and out of sight, leaving more open space. The differences in European or Japanese interior in urban areas have practically disappeared, and IKEA in Japan is as equally popular as it is in Europe. All have heard about the Japanese culture of removing one’s shoes before entering a home. Rina tells us that this tradition does not disappear even in the most modern apartments in Tokyo. “I have visited many homes in Japan and I have never witnessed that it would be acceptable to enter a home without removing the shoes.” Every home has a designated area where to remove and leave shoes. This area is commonly made of stone or concrete. The living room is separated with a step, and the floors are usually made of wood with a slightly raised level. Although it is common to have meals outside of home, Japanese cook at home as well. “During my studies in Germany I was surprised to find that a lot of people barely make any use of their cooker. Japanese meals constitute of small portions of different foods. A good Japanese wife spends a lot of time in the kitchen. Different dishes require considerable knowledge of cooking and a good number of recipes. Comparing to a European woman, I spend a lot more time cooking,” Rina states, as Pēteris confirms it with pride. Next to being famous for its cuisine, Japan is also famous for its tea ceremony. The tea ceremony is more a form of art, not commonly practiced as a daily ritual. Tea ceremonies are more commonly practiced at special tea houses and less at home; people leading these ceremonies have studied the art of serving tea, maintaining the tradition that has been handed down from generation to generation. In order to truly participate in the tea ceremony one must have in-depth understanding of the ritual. Rina confirms that not all Japanese have knowledge on this ritual. “I do not know all the details, but I drink tea every day,” she says. Another common misconception people have is the one on the traditional Japanese drink – sake. “Many people think that sake is a type of a vodka drink, which is not true, because the process of preparation is entirely different. Sake is a product of two simultaneous fermentation processes – similar to making wine and beer; sake is not a result of distillation process. It is important to pay attention to subtle cultural nuances when drinking sake. It is not customary to pour your own drink in Japan; it is considered to be polite form to pour the drink of others, which also ensures that someone will always make sure that you have sake in your glass. One should always hold up the glass for sake when it is being poured, and never leave the glass on the table for the pouring. It is customary to toast or simply say “Kanpai!”. It is always fascinating to learn about cultural differences in other places of the world. We learned that Latvians have certain similarities with the hospitable and friendly Japanese – even when not being invited over, one will always be met with open arms and as a friend. 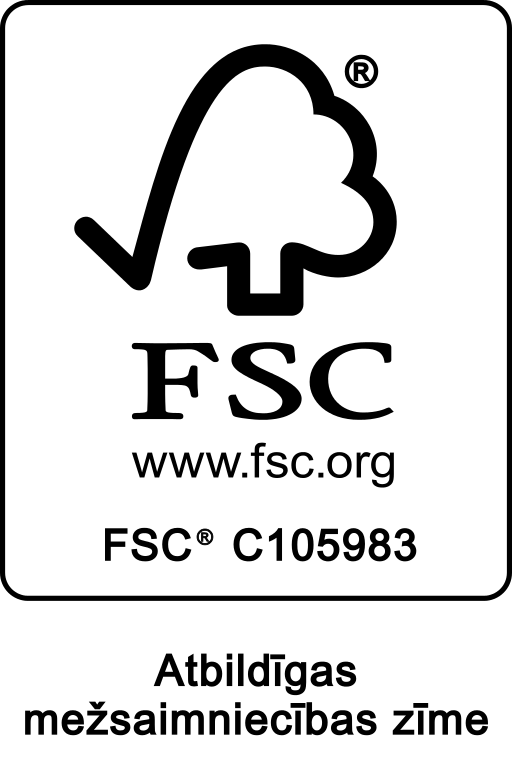 And, of course, the shared love of timber in both cultures is heart-warming.